Finally after 6 months of hard yakka our new website is up and running. Our old site was built way back in 2007 using the long outdated Oscommerce platform. While the old site worked extremely well it wasnt responsive (mobile friendly) and it didnt have the flexibility we needed to keep our search rankings at a competitive level. After much stressing I decided to change to a new shopping cart altogether and we chose Opencart. Opencart 2.0 had just been released which was fully responsive and much easier to modify than the old Oscommerce shopping cart however we needed to impliment around 100 plus mods to get the speed and SEO performance needed to keep our business afloat. The Opencart platform runs very slow with a large number of categories so we had to modify the number of queries going to the database and also set caching of images and headers etc. The caching stops once a customer adds a product to their cart. The next big issue was setting up seo friendly URL's and making every aspect of the site able to be fine tuned. This meant being able to fine tune URL's, headings, tiles, metatags and even image alt text. To further speed up the site we made sure that all images stipulated dimensions for faster load times. 1. An easy cartridge finder that was accesible from every page on the site. 2. A fast loading minimalistic site which was very easy to use. 3. A one page checkout requiring only the very basic but essential customer details. 4. Customer reward points ( these are yet to be implemented but are installed ready to go when time permits). Our new site utilises the very latest SSL security. This means that anytime a customer registers, logs in or makes a purchase all of their imformation is fully encrypted. All of our credit card processing is 100% secure and no card details are stored or kept in our database. Customers can now log into their accounts and print their own invoices or look up past transactions and print them. 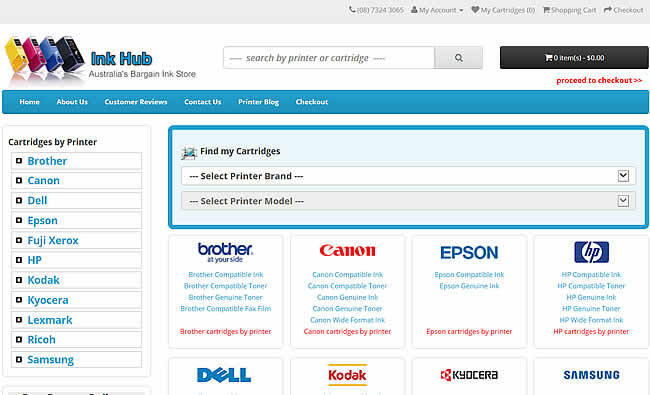 We have also added images of all printers to make it more user friendly and help to identifiy your cartridges. If you have any suggestions about how we could improve the site feel free to drop us an email.